I love writing, mixing, and mastering music in many different combinations of genres, but I feel like I specialize in ambient, glitch, and dubstep. Feel free to use any of my music (Creative Commons as long as they're on my account)! Totally fine as long as you refer back to me by writing "timaeus222 on SoundCloud" or the URL to my SoundCloud (or both!). Contact me on my website if you so desire. ----- Truong-Son "Timaeus" Nguyen is a huge music enthusiast who also dabbles in a few other hobbies such as web design (independent studying since 2004, 1 year of classes) and graphics design (independent studying since 2008), honing and widening his technological skills. Music is his greatest passion, and in his free time he loves trying to coming up with fresh, new synthesized sounds, whether it be a new type of bell, a wah-tar (he'll let you figure out what the "tar" is from), or a granular, gritty vocaloid bass. As a music lover, he doesn't like limiting himself to listening to or writing in any particular genre. As such, he has practiced his mixing and mastering skills on such genres as ambient, chiptune, rock/metal, dubstep, glitch, and a little cinematic as well. He listens to pretty much any genre other than generic hip-hop and rap. If it's spiced up with more elements though, he won't mind too much. With more than six years of classical piano training and more than three years of jazz piano training, Timaeus gets very excited if he comes up with harmonic and countermelodic content that bursts with sophistication, and sometimes his ideas arrive faster than his hands can play them out on his MIDI keyboard or piano! His musical specialties have been and always will be glitch effects and complex elements. In his music, there will generally be a section that audiophiles can truly appreciate---wild glitch improv, rich ambient breakdowns, flaunty drums, dub wubbery, etc. Audio quality, arrangement sophistication, and mixing competency are Timaeus's highest priorities in writing music. If you ask him to give you musical feedback, he'll say what's honestly on his mind, not necessarily generic (unhelpful) praise. It doesn't mean his comments will be particularly berating, but they will certainly be straightforward and precise/consistent. 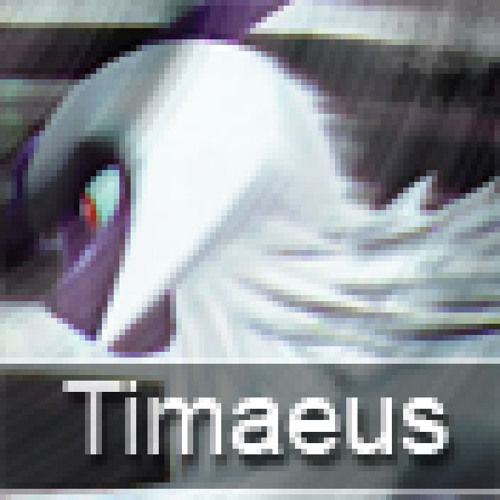 With Timaeus, it isn't all seriousness, though. Sometimes he plays video games and posts videos on YouTube, works on websites, creates graphics, hones his piano skills, and even does a little mixed martial arts on the side. His favorite school subjects have been Chemistry and Math, plus some Computer Science for a little flavor.